Mercy (по разказа "Баба") ще излезе на DVD в края на октомври. The flick, from Universal Pictures and Blumhouse Productions, stars Dylan McDermott, Frances O'Connor, Chandler Riggs, Joel Courtney, Shirley Knight, and Chris Browning. Peter Cornwell (The Haunting in Connecticut) is directing this adaptation of the Stephen King short story from his Skeleton Crew novel from a script by Matt Greenberg. 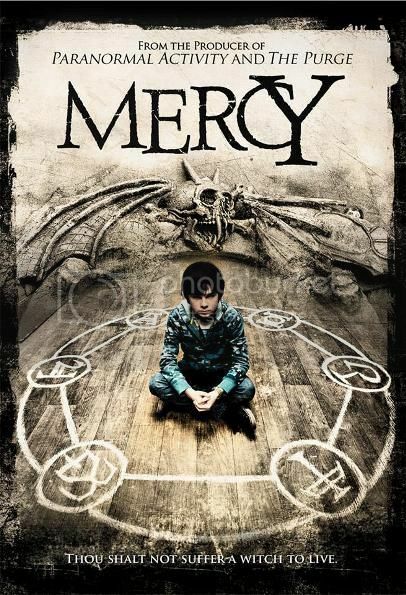 Based on a short story by Stephen King, Mercy tells the tale of two young boys (“The Walking Dead”'s Chandler Riggs and Super 8's Joel Courtney) who move with their mother to take care of their dying grandmother at her decrepit farmhouse. When they suspect that the elderly woman they love has encountered a dark spirit, they fear she might not be the only one who won’t make it through the summer alive. Once George (Riggs) and Buddy McCoy (Courtney) arrive at their Gramma Mercy’s (Shirley Knight), what they find inside her 150-year-old home is nothing short of terrifying. As the brothers experience deeply disturbing phenomena they believe to be the work of an ancient witch, they must fight for their lives and overcome the evil forces threatening their family. The grandmother is a witch, who made an evil deal using black magic years earlier. Сигурно е поредният провал по произведение на Кинг.А разказът е един от най-добрите на Кралят. "Mercy" е по-скоро вдъхновен от разказа, отколкото негова екранизация. Не се придържа особено към оригиналната история.